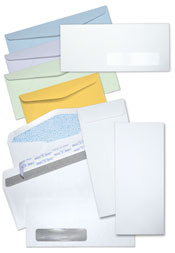 Commercial envelopes are the most common style of business envelopes. They come in a variety of sizes and colors, the most popular of which are the #10 envelope and the #9 reply envelope. Commercial envelopes are excellent for activities such as mailing checks, letters, invoices, etc. All Commercial envelopes are available with the option of being ordered Plain or with Printing.